I have written about various food promotions at Daniell’s Tavern at The Imperial New Delhi over the years, but it just struck me that I never shared the interesting story behind this fine-dine Indian restaurant. The uncle and nephew duo - Thomas and William Daniell – were artists who were commissioned by the British Empire in 1786 to capture the rich culture and culinary traditions of India in their paintings. After starting their journey in Calcutta they moved up North and West travelling along the Ganges as far as Kanpur and the Mughal cities of Agra and Delhi. On their way back the Daniells stopped at Lucknow and were vastly influenced by the city’s royal resplendence. The next port of call was Madras and then Mysore followed by Bombay before they returned to England. While they did a fine job of 144 sceneries of India, they also collected a plethora of recipes through their travels. The eclectic menu of Daniell’s Tavern thus brings alive the taste of each of the places they visited. Time and again, the restaurant hosts special promotions to celebrate either the unique dishes of a particular region, or new additions to the existing menu. The latest one, called the Clash of The Titans was a neck-to-neck presentation of Dilli ka Swaad and Lucknowi Andaaz. Both the chefs helming this promotion came armed with rich culinary legacies. 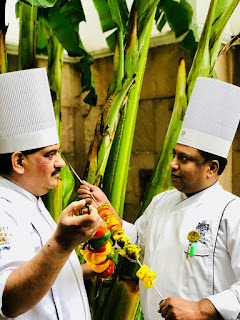 Chef Mirza Munnawar Baig is a fourth generation of Khansama from Lucknow. His forefathers used to work with Nawabs of Awadh and their gharanas. He presented traditional kebabs like kakori, galouti along with the all time famous biryanis. Chef Ved Prakash, on the other hand, brought a repertoire of old Delhi dishes, especially the kind that were served in his grandfather’s eatery during pre-Independence days. What followed was an array of Chef Mirza’s gosht ki ghilawat, kakori kebabs, chakunder aur raamdana ki tikki and dum biryanis and Chef Ved’s guchhi mussalam, mahi nazakat, Dilli6 ka mutton korma and Purani Dilli ka shahi tukda. The delicious meal was served in the most luxurious setting. But the best takeaway turned out be the recipes shared by both the chefs. I am sharing the recipes below for your benefit. Do try your hand at some of these traditional dishes and drop in a word about how they turn out. Daniell’s Tavern, The Imperial, Janpath, New Delhi – 110001. Clasf of the Titans menu available till 24th November 2018. 1. Take hung curd in a bowl, add grated paneer, chop ginger, green chilli, green coriander, garam masala, elaichi powder, roasted jeera powder and salt. 2. Mix all neatly and fold this, mix with soft hands with roasted chana powder and bread crumbs. 3. Make balls and stuff it with Anjeer and flat stuffed balls and shallow fry on slow fire. 4. Serve with mint chutney. 1. Rub Lamb boti with red chilly powder, cardamom powder, garam masala powder, salt, ginger and garlic paste, and keep it aside to rest for 2 hours. 2. Mince it six times with onion and coriander roots. 3. Add cashew nut paste, almond paste, saffron and kewra water and rub it well. 4. Put this mince on skewer and cook it on sigdi. Turn it after intervals. 1. Wash and clean the fish. Cut it into tikka cut. Mix salt, ginger, garlic and lemon juice and keep it aside for at least 30 minutes. 2. Mix all the spices with hung curd and mix it well. 3. Add the fish and let it marinate for 1 hour. 4. Arrange the skewers across the clay oven about 4-5 inches from the heat. Turn it regularly until it turns light brown in color. Cook it for 7-10 minutes. 5. Baste it with oil and leave it for 10 minutes. Again, cook it until it turns golden brown. 6. Remove it from tandoor and apply fresh lemon juice. 7. Serve hot with mint chutney. 1. Take a Lagan. Add mutton boti and roast it for about 5 minutes. Add salt, ginger, garlic, red chilly powder, whole green masala, and onion. 2. Add green chilly, coriander and then add chana dal and boil it. 3. Cook mutton until the water is absorbed totally and the meat becomes tender. 4. Allow the mixture of mutton to cool down completely. 5. Blend the mixture of mutton into a fine paste. 6. Add cardamom powder, garam masala, roasted chana powder and salt. 7. Make a tikki in round shape. 8. Heat a tawa, add ghee and griddle fry tikki until it turns golden in colour. 9. Serve with mint chutney and laccha onion. 1. Dice the Jimikand. Boil it with ginger, garlic, red chilly powder, clove and mash it. 2. Make brown onion and cashewnut paste. 3. Take a Lagan. Add ghee and Jimikand paste. Cook it for 20 minutes. 4. Add onion, cashewnut paste, garam masala, cardamom powder, Javitri powder, roasted chana and salt. Mix it. 5. Make a tikki in round shape. 6. Heat a tawa, add ghee and griddle fry tikki until it turns golden in colour. 7. Serve with mint chutney and laccha onion. 1. Take Ghee in a pan. Put khada masala, let it crackle. Add sliced onion. Cook till it turns golden brown in colour. 2. Add Mutton boti and mutton curry cut. Cook till it releases oil. Now add ginger and garlic paste and all the spices. 3. Cook on slow fire. Add some water. 4. Check seasoning and serve hot. 1. Take fresh vegetables – carrots, beans, cauliflower and green peas. Wash them properly and leave them aside to dry. 2. Take Ghee in a pan. Put jeera, ginger, garlic and all the vegetables. Cook it properly. Once cooked, let it cool down. 3. Grind into fine paste. 4. Take oil in a pan. Add chopped ginger, garlic and the ground vegetables. Add water. 5. Let it boil. Once done, check seasoning, add almond slivers and serve hot with namak pare. 1. Clean fish fillet. Pat it dry. Flat it with a knife. 2. Prepare stuffing with cashew nut, raisin, green coriander and khoya. 3. Place fish on the table. Put stuffing and make a nice roll. Bake it in salamander. 4. Take all in a pan. Add Royal Cumin, onion and tomato paste and cook it properly. 5. Place fish roll in a serving plate. Add fine gravy on it. Garnish with fresh coriander.